Viking Books for Young Readers, 9780670059867, 48pp. It all started when I told my friend Art I would meet him on the corner of Fifth and Fifty-Third. I didn't see him. So I asked a lady walking up the avenue, "Have you seen Art?" "Uh . . . no, he's just a friend." "Just down Fifty-Third Street here. In a beautiful new building. You can't miss it." When this address turns out to be the Museum of Modern Art in New York City, confusion and hilarity ensue. As the narrator continues looking for Art inside MoMA, he is introduced to well-known pieces of art such as Van Gogh's The Starry Night, Matisse's The Red Studio, as well as works by Picasso, Klee, Lichtenstein and others. 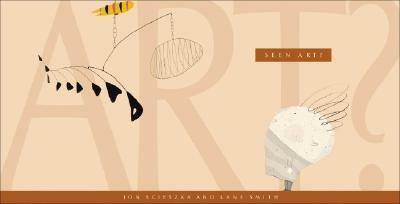 In a dynamic collaboration that features comical text and playful illustrations alongside full-color reproductions of the artwork, Jon Scieszka and Lane Smith give readers the perfect companion for a visit to MoMA, and an introduction to some of the world's best works of modern art.